In today’s world there aren’t a lot of options for those who want a small car with decent cargo space. You either buy a crossover or a hatchback, and Americans aren’t really big on the latter of the two. The good news is that there are a ton of CUVs in a variety of styles and price points. The bad news is that they aren’t all that fun to drive. Well, most of them. There aren’t many solid alternatives out there. But after spending a week with the the Mini Cooper Clubman S, I know there is at least one. This is Mini’s family wagon, so to speak, and offers 17.5 cubic feet of cargo space with the rear seats up and 47.9 with them folded in a 60/40 split. This is more space than the Nissan Juke offers (10.5 cubic feet/39.5 cubic feet) but less than the Kia Soul (24.2 cubic feet/61.3 cubic feet). The Clubman S is not a world-beater in the storage department but it does have one edge over its competitors: its swinging rear doors. The two swinging doors make loading and unloading cargo infinitely easier; they can also be automatically opened via the key fob should you have your hands full. The swinging doors also give the Clubman S a more wagon-y appeal. I love the look but have a hard time calling the Clubman pretty. It’s not ugly or anything, but you can’t expect that charming Mini design to stay fully intact once you start adding size. Still, it’s much easier on the eyes than the bloated Countryman and its wagon-esque shape is more appealing than most CUVs. You’ve got to give the automaker credit for being able to take what is ostensibly one design and grow it without entirely sacrificing the look of the original model. That’s not an easy task. Just ask Fiat. When it comes to interior space, the Cooper Clubman S is surprisingly spacious. Four adults fit comfortably inside without any legs smashing into seats or heads hitting ceilings. The quality of the interior and the cabin design was also above what you’d find in many crossovers. I fell hard for the leather in this car. Remember that Mini is owned by BMW, with the latter having just a bit of history in the luxury space. At $1,500 the Pure Burgundy leather package is money well spent. It adds a touch of class to the cabin and is just so damn soft. Outside of the leather and other upscale goodies like the $1,800 Premium Package, which adds a panoramic moonroof, Harman Kardon sound system and keyless entry, the cabin is entirely Mini. That means a quirky infotainment system with little cartoony icons notifying you of changes in driving modes and switches like those you’d see in an airplane cockpit that let you do everything from start the car to disengage traction control. Speaking of quirkiness, the gauge cluster moves when you adjust the position of the steering wheel. That caught me off guard as a Mini newbie. This atypical approach may come off as annoying to some but I found it to be a breath of fresh air. I much prefer flipping fun switches to pushing lifeless buttons. In fact, my only real complaint about the cabin of the Cooper Clubman S is that the control wheel for the infotainment system seems to be permanently inverted, as in scrolling clockwise moves you up and counterclockwise moves you down. It’s a small issue but one I wasn’t able to fix and that proved annoying time and again. I know BMW owns Mini but does it still need to keep the company line and charge extra for everything? Other than those issues I found the cabin to be upscale, spacious and comfortable on longer rides. But where the Mini Cooper Clubman S truly stands out from the crossovers you could be buying is in its drivability. 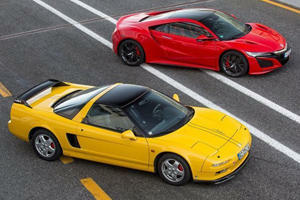 Under the hood is a 2.0-liter turbo-four producing 189 horsepower and 207 lb-ft of torque. My model came equipped with the optional ($1,750) eight-speed sport automatic transmission. This setup adds paddle shifters and promises “quicker gear changes and more aggressive shift points.” Three driving modes are present here: Sport, Green and Mid (a mix of the two). The optional sport auto was nothing special, with the Mini wading through its gears before truly leveraging all of its power once freeway speeds were approached. Despite the pedestrian transmission the Cooper Clubman S is actually pretty fun to drive. The Clubman is the longest car in the automaker’s lineup—and also the heaviest S trim at 3,300 pounds—but it still handles as if it’s a mini Mini. The steering was sharp and not overly electronically aided. The little car was a blast to weave in and out of city traffic and provided a smooth ride on the highway. 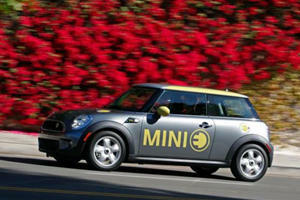 In fact, the only thing Mini seems to have botched here is the torque steer. The Clubman S can do 0-60 mph in 6.6 seconds. But hammer the gas off the line and the wheel of the Clubman S will jerk noticeably every time. It’s the only real bummer in an otherwise engaging driving experience. I averaged about 20.8 mpg in the city. The official split is 24/34/27. My tester stickered at $38,750 with all options included. This isn’t exactly a price that encourages cross shopping with crossovers. 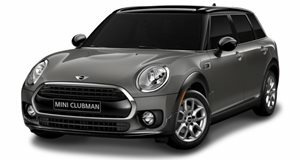 But before options the Clubman S was just $27,650. If you can live without things like the aforementioned sport automatic transmission and the HUD ($750 extra) then you could be getting a car that’s fun to drive, has an upscale and fun interior, just as capable as any crossover (sans higher ride height) for about $30,000-ish. It’s clear that Americans only like hatches when they’re hot and are forever over wagons. The Mini Cooper Clubman S could represent our last best hope in keeping crossovers from completely taking over our roads. That is one seriously amazing milestone. 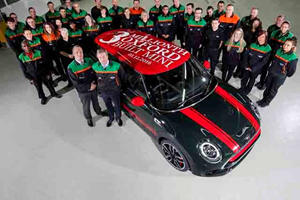 The three millionth car was a pretty good one, a John Cooper Works Clubman. Let's just say it's not the Superleggera or the Rocketman.